The design for this reversible watch dates back to the 1930s, 1931 to be precise. Polo players were sick and tired of broken and damaged crystals on their timepieces when playing this noble game. Jaeger-LeCoultre came up with the idea of making it possible to flip the watch on your wrist, so that the crystal was protected from serious beatings. 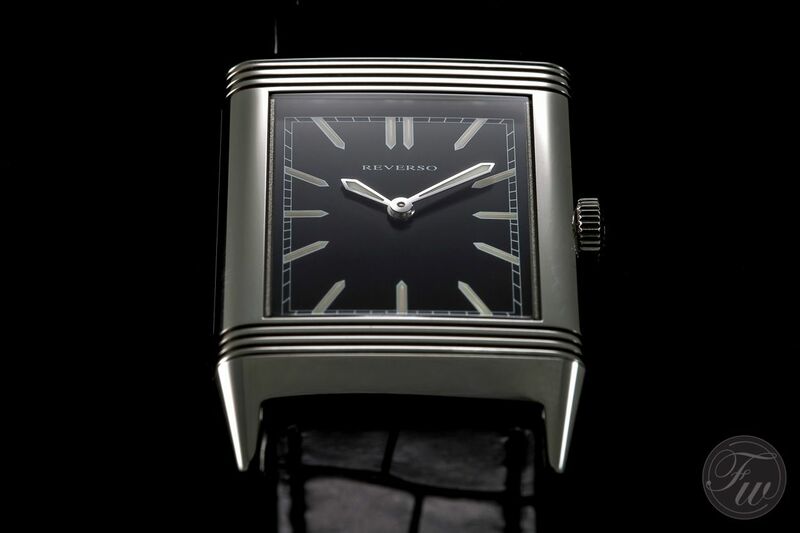 In 1931, Jaeger-LeCoultre introduced (and patented) the Reverso watch. 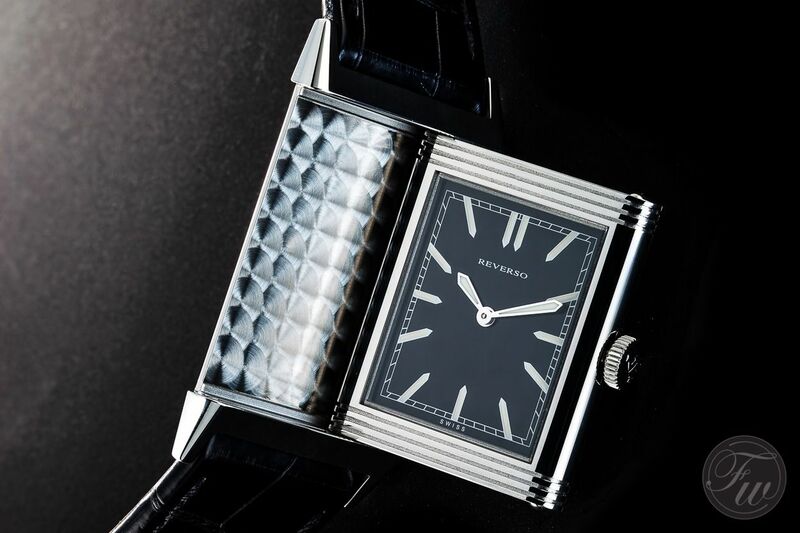 Through the decades, the Reverso developed and grew out to become the elegant watch it is now. In 2011, Jaeger-LeCoultre celebrated the 80th anniversary of the Reverso collection. During the SIHH 2011 in Geneva, Jaeger-LeCoultre commemorated this anniversary with this Grande Reverso Ultra Thin Tribute to 1931 model. Jaeger-LeCoultre takes the ultra thin definition quite seriously, the Reverso is only 7.2mm thick. Jaeger-LeCoultre in The Netherlands lend us their Grande Reverso Ultra Thin Tribute to 1931 for a week. This gave me some time to do some hands-on experience with this timepiece and our photographer Bert Buijsrogge to get it in front of his camera lens. I had tried a Reverso before a few years ago, from my colleague Frank Geelen of the Monochrome blog, who had one (Grande Date 8 – days if I’m not mistaken) in his private collection. Although I loved the appearance of the Reverso, I found the watch to be a bit too thick. This ultra thin Tribute to 1931 ref. 2788570 model sounded like a perfect opportunity to give the Reverso another chance. Colleague Ming Thein, who’s a huge Jaeger-LeCoultre fan, already did a write-up on the Reverso Gyrotourbillon 2 and Reverso Classique here on Fratellowatches. His posts certainly made me even more enthusiastic about the Reverso, so I was very eager to give the Tribute to 1931 model a spin. Although I can physically handle any Reverso I’m afraid, I have a weak spot for ultra thin watches. I find them very elegant, even on fairly large wrists. You don’t always need a large watch in my humble opinion, even though you can easily handle one. With modest dimensions of 46mm in length, 27.5mm in width and only 7.2 in height, this watch will fit almost anyone. Although 46mm seems big, it will fit a normal wrist easily. 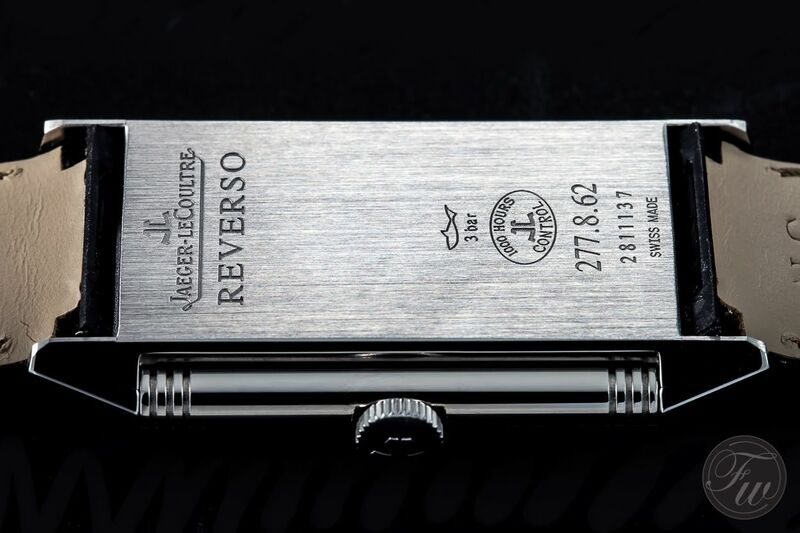 The ratio of the Reverso is just perfect, especially with the ultra thin case. In my case, this Reverso fits me like a glove. The thin case is so comfortable, especially in combination with the beautiful alligator strap. I wonder if I ever would reverse the case on my wrist, it is very easy to do so. Just grab the right side of the watch, pull it and slide the left side of the case through the right side and turn the crown side of the watch all the way to the left. And click. A bit difficult to explain in words, but the picture below probably makes more sense. It is not easy to define or even to explain what makes a watch an icon. Much like the X-Factor. 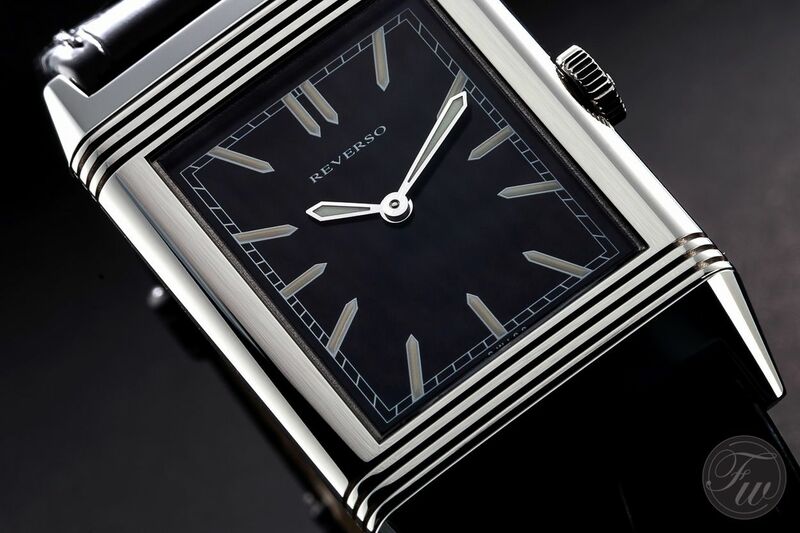 The Reverso however, is clearly a watch that deserved the status of being an icon a long time ago already. 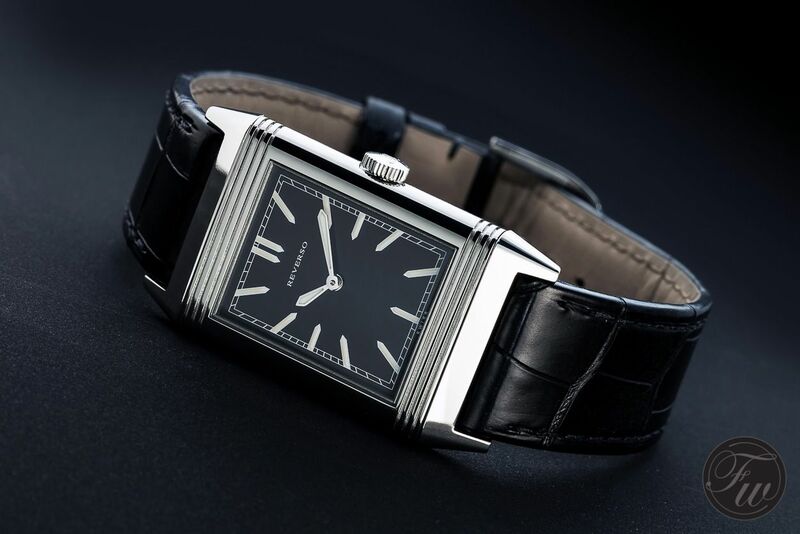 Together with the Cartier Tank, it is the most recognizable rectangular watch out there. Jaeger-LeCoultre has quite a large number of variations of the Reverso and it is also a strong collection for ladies. These variations range from the hours and minutes only, like this Reverso Tribute to 1931 model, to models that have a minute repeater and tourbillon complication. Although these latter models certainly have the appearance of the iconic Reverso, I believe that this ultra thin Tribute to 1931 model will become an icon itself. The clean Art Deco style dial, the influences of the original Reverso and of course the thin case make this a Reverso that definitely stands out in my opinion. As explained above, it is very easy to reverse the case of this watch. As you can see on one of the pictures above, the part that would be normally considered as the inner case back, is finished with beautiful perlage. Although the in-house developed movement caliber 822 is worth looking at, Jaeger-LeCoultre decided to stay close to the original and kept the case closed. The high polish finish of the case looks wonderful and leaves room for a personal inscription, family weapon or other kind of engraving. The brushed finish on the case back has a serene appearance, but does feature a few engravings and markings. Where we didn’t find the brand name on the front, the case back does mention the company from Le Sentier and the fact that it is a Reverso. Something which wasn’t necessary, but it doesn’t bother me as well. As you can see on the photo below, the watch is also water resistant to 3 bar (30 meters) and was subject to a 1000 hours of control by the watch makers of Jaeger-LeCoultre. Other than with the Chronometer rating (COSC), the Jaeger-LeCoultre watches are being tested for accuracy in their cases instead of testing the movements only. This Jaeger-LeCoultre Reverso Tribute to 1931 was on my wrist for one week and it was very difficult to let it go. It is clearly something different from many other watches out there that are considered to be an icon (like a Submariner, Speedmaster, Royal Oak, Nautilus or even a Tank). If you are a regular reader of this blog, you will know that I am a sucker for iconic watches. 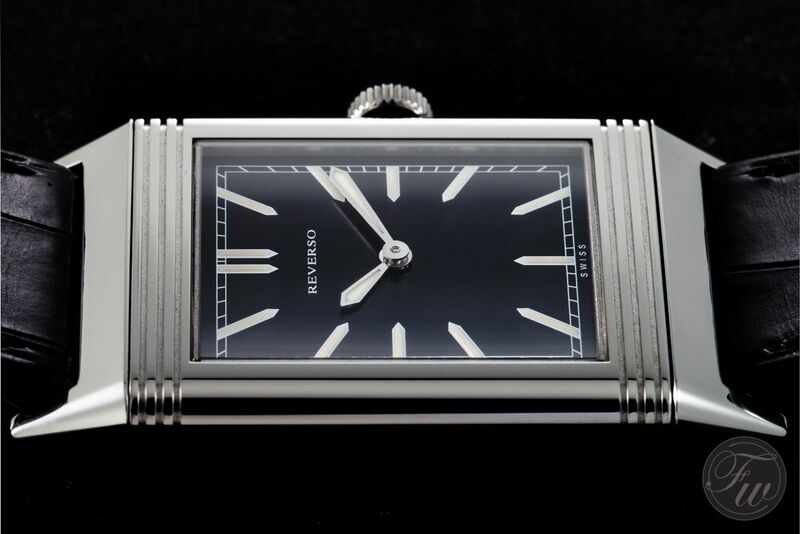 This Reverso would blend in perfectly in my modest collection of watches. It was quite an experience wearing this rectangular beauty from Jaeger-LeCoultre, as it gave me a total different feel than the other Reverso I’d tried in the past. The thin case almost integrates seamlessly with the nice black alligator strap (and stainless steel buckle). The elegant appearance makes this watch perfect company for formal occasions or when wearing a shirt and tie. I have to be honest and tell you that I really had to get used wearing this watch with a casual outfit. You can get away with it of course, but keep in mind that the alligator strap and high polished thin case will attract attention when wearing a t-shirt or a polo shirt. More information can be found on the official Jaeger-LeCoultre website. All photos in this article can be clicked for a larger version.